List of Ramadhan Buffet 2008. Berikut adalah senarai tempat berbuka puasa sekitar Lembah Klang. No. 6, Jalan PJU 7/3 Mutiara Damansara, Petaling Jaya, Selangor. Starting 4th – 26th Sept.
CIMB cardholders also enjoy a 20% discount. Savour the world’s best, from the East to the West with world-class international and kampung-styled local cuisines. Batak singers will help you unwind as they croon hits from 8.30 pm until the wee hours of the night. ‘Kampung styled’ cooking like Ketam Masak Kari, Pucuk Ubi Masak Lemak keledek, Ikan Assam Pedas, Ayam Percik, Ulaman Kampung, Sambal Belacan, Cencaluk and many more traditional delights to whet your appetite this Ramadhan. While you feast on the delicious food, you will be accompanied by Live ‘Lagu Melayu Asli’ during the breaking of fast. Traditionally, Kurma or Dates will be given away to all diners. As a special treat, Roast Lamb Carving will also be available to diners. RM69.00++ per adult, 50% off for children (4 -12 years) and senior citizen. Signature Sup Rusa, Rendang Ayam, Sambal Udang Petai, Serunding Ayam, Bubur Lambuk, Sup Ekor, Balitong Masak Lemak Cili Api, Pari Asam Pedas, Patin Masak Tempoyak, Lemang, Ketupat and Aneka Kuih Raya. In addition, well-known local performer Syed Muradzi Syed Shamsul Baharun or Dee will be on hand every single day to ensure your great food is accompanied by great entertainment as well! *20% off Food & Beverage for HSBC, Hong Leong Bank, Maybank, AEON, Citibank and Diners Club card holders. Traditional Malay delicacies served throughout the month of Ramadhan. Luscious dishes such as kambing panggang, gulai daging kawah, satay, otak-otak, nasi briyani gum, lemang, serunding, malay kuih and the chocolate fountain with condiments amongst others will be available to tickle your taste buds. A colourful mix of traditional Ramadhan delights, hawker stall favourites, a mix of Malay, Chinese, Indian, Western, Arabic & Japanese cuisine. RM98.00++ per person (Monday to Thursday) and RM108.00++ per person (Friday to Sunday). Ramadhan buffet diner featuring tasty Malays favourites such as Ayam Masak Lemak Kuning, Gulai Daging, Sarak Udan and Stay Anika with traditional condiments. Live action stations are also available where Marinated Roast Lamb Shoulder, ABC and condiments will be prepared fresh on demand. Relish in 100 mouth-watering dishes that will surely tempt your palate. Chose the action stall from grilled counter, tempura and shushi counter and many more. Buffet is at RM50.00++ on the first week of Ramadhan (1st - 7th September). Heaps of delicious delights, specially prepared by Chef Jasmin Mohd Zon. Buka puasa’ with varieties of local and Western cuisine throughout the Ramadhan month….recommendations such as ‘Rendang Tok, ‘Ayam Dara Kalasan’, ‘Ketam Goreng Berempah’, and ‘Gulai Nangka Bertulang Rawan’ and many more. Check out eight action stalls, with choices of Grilled Seafood with Assam Sauce, Chicken Kebab, Mee Curry, Sotong Kangkung, Popiah Basah, Dim Sum and many more! Ghazal band performs nightly! Le Méridien Kuala Lumpur offers a choice of three different venues to ‘Buka Puasa’. The buffet tables at Latest Recipe, Al Nafourah and Sultan’s Ballroom are filled to the brim with traditional local delights and International fare. sirap bandung and soya bean. 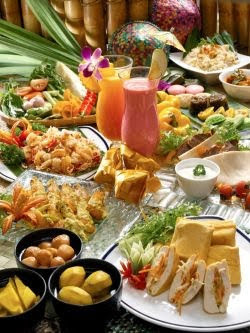 With more than 50 delectable offerings to choose from, it will indeed be a wonderful and satisfying feast. Promotion: Every five (5) paying diners, one (1) dines for FREE. Come savour the skills of Chef Samsol and his team at Abdul & Charlie’s with our lavish buffet spread, featuring all the Kampung delights in Malaysia. Promotion: First week of Ramadhan pay only RM38nett per person. Fancy Malay food? Let Chef Azman teach you a thing or two about sizzling Malay cuisines at his cooking class. Have fun at our demo cooking classes held every Friday night! Walk away with culinary knowledge and dazzle your friends with it. Enjoy a scrumptious buffer at the Window Restaurant and Courtyard Café. The very best in classical Malay dishes coupled with a range of local favourites that are reflective of our country’s diversity and harmony. With over 100 fantastic specialties offered at the buffet line, diners are invited to view the various action cooking stations and be spoilt for choice with the marvelous selection of local and international favourites. p/s: Senarai ini adalah rujukan semata-mata, terpulang kepada individu itu sendiri mengikut citarasa dan poket masing-masing. wah ini untuk sebulan punya round ni...kan.